Scientists have deployed a research buoy near FIU’s Biscayne Bay Campus to monitor conditions in light of the recent red tide outbreak in Miami-Dade County. 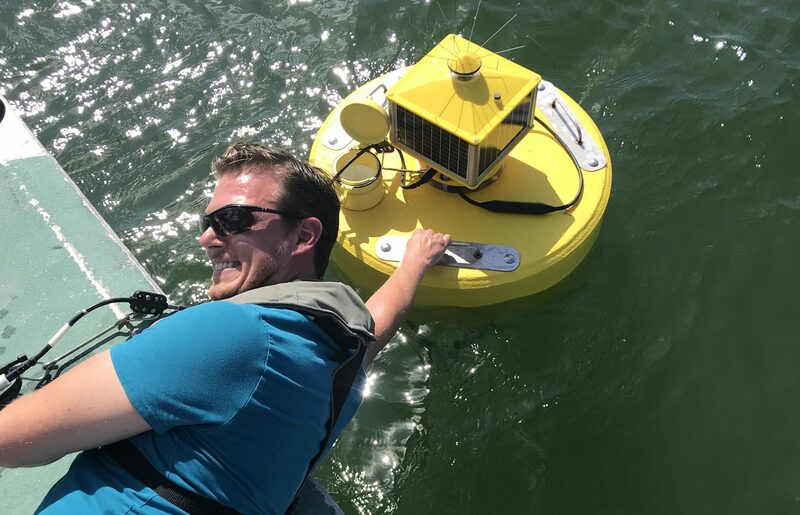 The buoy is armed with sensors that gauge overall water quality and could serve as an early alert if conditions deteriorate, said Bradley Schonhoff, program manager for FIU’s Center for Aquatic Chemistry and Environment in the Institute of Water and Environment. The center is a National Science Foundation Center of Research Excellence in Science and Technology. The buoy measures temperature, salinity, dissolved oxygen, turbidity, depth, chlorophyll and other conditions in five-minute increments. The data collected is updated online every 15 minutes and available to the public. “The buoy can give us a measurement every five minutes so that real time data gives you a much broader context of trends,” Schonhoff said. Deployed Oct. 4, the buoy was placed in a strategic location near Haulover Inlet where saltwater and freshwater mix during the tides. The chlorophyll readings are of particular interest to Schonhoff, because that is what could indicate the presence of more algae. Current readings show normal levels, he said. The research team of faculty and students is also collecting water samples to do additional testing. Bradley Schonhoff deploys a monitoring buoy near BBC Oct. 4.